We offer sheet metalFuel Capswhich is available in standard sizes. Our industrial oil caps are leak proof, high chemical and temperature resistivity that provides them a longer life. 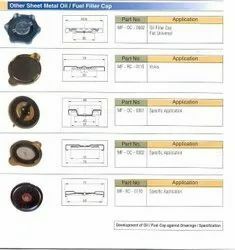 We also offer our industrial oil caps in customize sizes and at the most competitive prices to our customers. Our oil caps helps in reducing the chance of oil leaks and their associated dangers. These sheet metal fuel filler caps are made perfect in dimension so that the gap should not occur which leads to wastage of fuel.